When you approach the site of a recent predator kill, and the cat activity has subsided somewhat, the scavengers descend upon the area to clean-up and help the eco-system of the Kruger. A wake of vultures surround the feeding zone, and then the chaos begins. The vulture restaurant has a pecking order, and a species hierarchy when it comes to feasting. Each species has a specific role to play in at the site of the carcass, which we discuss below. This tough beast of a vulture has a meat-shredding beak that can rip apart a carcass in an instant. 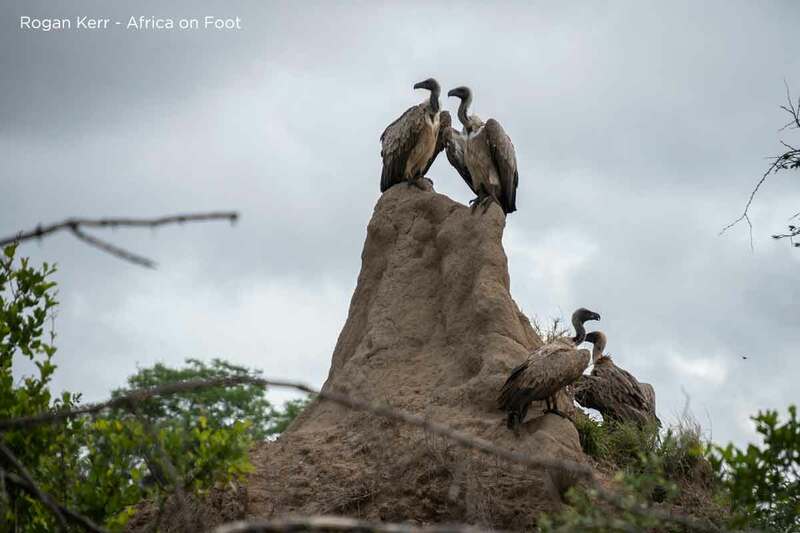 The old-world, prehistoric-looking bird is Africa’s largest vulture and has a rather imposing presence. It’s an endangered raptor that is illegally poached for its parts which are used in traditional medicine. The role of a lappet-faced at a kill site is one of vital importance. They perform tasks that other others are incapable of doing because of their anatomy. If other species of vulture cannot access the flesh on a carcass because the hide is too substantial, in swoops the Lappet-faced SWAT team! That meat-hook of a beak can easily penetrate the most sinewy and rugged meat. Although not the first to arrive at a kill, and by no means, the most comical, they are certainly the Kings of the carcass. These are our most entertaining and comical vultures. They catch wind of an abandoned kill and swoop into the kill site, providing a canopy of confusion hovering over the carrion. The bounce from foot-to-foot, flapping about and jostle around the carcass. They need the lappets to tear apart the flesh and leave the hide before they can access the smaller fleshy bits, their favourite part of the carcass. 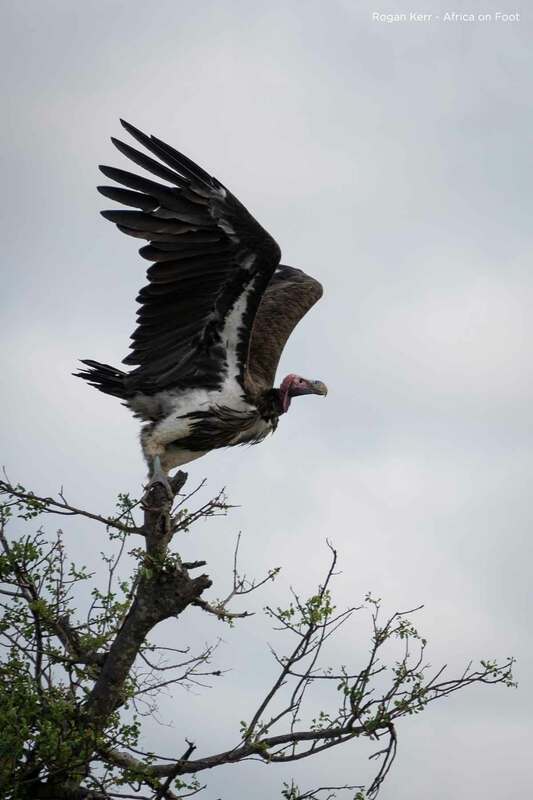 The white-backed vulture is a typical vulture – one of the most commonly spotted scavenging raptors in the Kruger. The coy white-headed vultures are finicky scavengers. 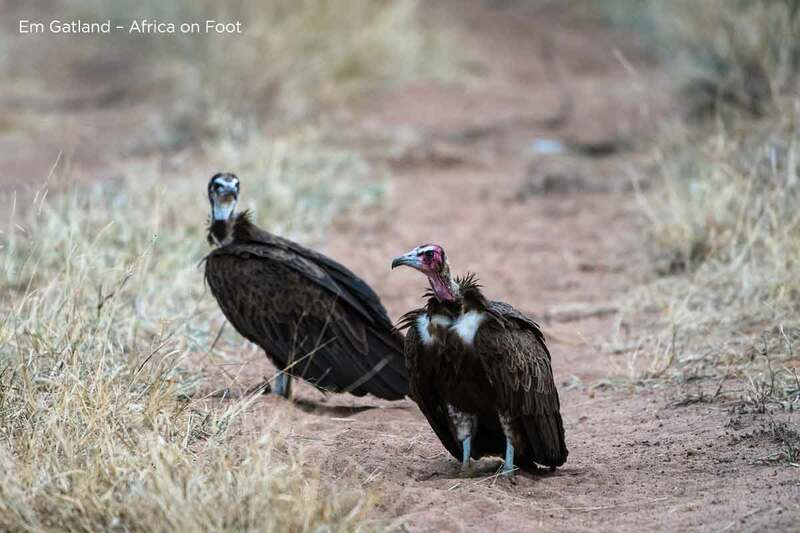 while the white-backs are indulging in the fleshy meat section of the carcass, the white-headed vultures are happy to eat any part of the animal. The trouble is, they cannot access their favourite bits without the help of the Kingpins. These introverted vultures are referred to as “clean feeders” and enjoy keeping their plumage clean. They wait until the mania of the massive wakes has subsided, and then move in to pick away quietly at the dry bones and other neglected parts of the carrion. 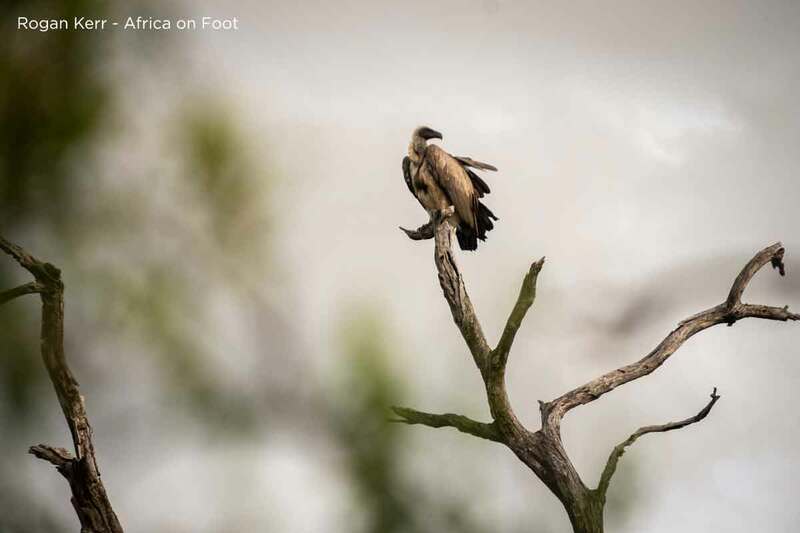 The hooded vulture is another small vulture – and like the white-headed vulture – is also a shy raptor. Their favourite cut of meat? They tend to feast on the more tender pieces of flesh, membrane, eyes and other small parts of carrion. It has a sharp beak that can prick and probe small cavities on the carcass, and hard to reach places. They wait until the wake has disappeared before moving in to feed. Interestingly enough, their face turns a shade of crimson when they are excited or aggressive. There are colonies of Cape vultures within the Kruger. Mariep’s Kop has the largest colony of Cape vultures, but these birds are quite nomadic which is why we see them in various regions within the Kruger. 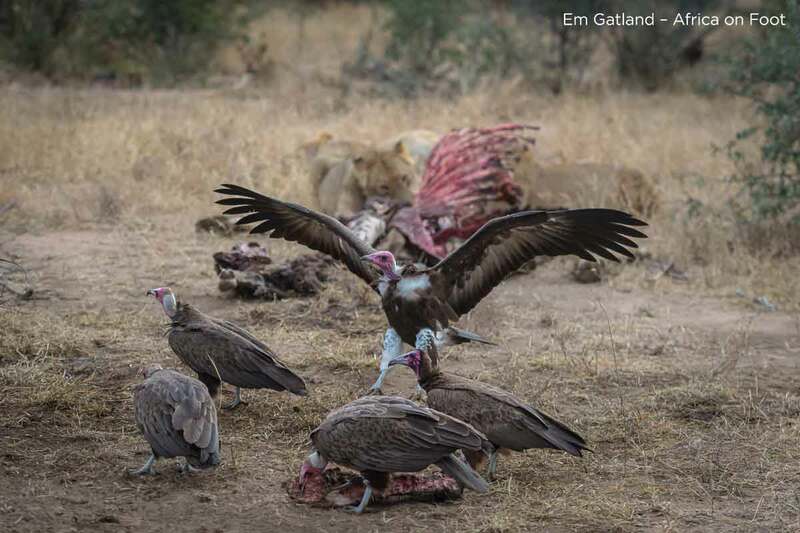 The Cape vulture is also a fan of the flesh of a carcass!